Read an article about CSESA cohort 3 that took place November 15–16, 2018 at the Van Andel Education Institute in Grand Rapids, Michigan. 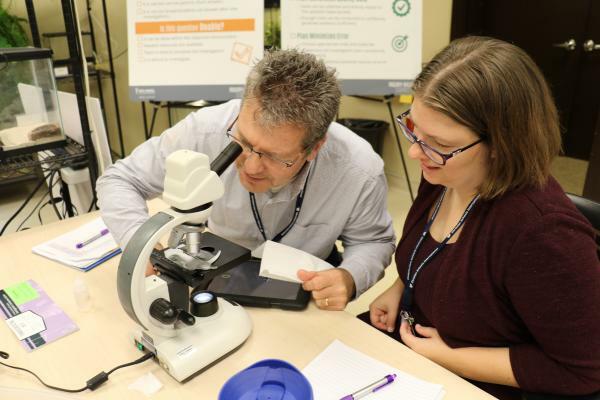 The third annual Christian School Educators Science Academy (CSESA) kicked off in Grand Rapids, Michigan on November 15. Ken Bergwerff, CSESA worldview facilitator, got the event started with the opening devotional, “This Is My Father’s World,” focusing on the awe and wonder of our God and the privilege of teaching science to the next generation of creation enjoyers and earth keepers. The Academy, which gathered 41 passionate and gifted science teachers, along with 6 lead teachers, who were able to spend two days immersing themselves in an inquiry-based model of science instruction from a biblical worldview. Over the course of the two days teachers were encouraged to interact with the model from the viewpoint of the student, among other things participating in a structured inquiry lab with Daphnia and an engineering lab where they were tasked to “Save the City.” The Van Andel Education Institute (VAEI) staff along with Susan Koppendrayer, CSI STEM education specialist, and Ken Bergwerff, presented each step of the process (initial question, personal knowledge, prediction, investigation, observation, data analysis, and claim/evidence/reasoning) as an opportunity to share God’s story with students without compromising high quality science teaching and learning. Teachers left feeling valued and inspired in their profession as well as having some useful and practical resources to implement when they got back to their classrooms. Many were very encouraged by the advice on how to make small changes over time to create realistic and long-lasting transformations in their lesson plans. CSI also heard valuable feedback from attendees about how much they appreciated being able to attend a professional development training where the biblical worldview integration was so intentional and how they could help their students see the fingerprints of God in their daily work. Once again, CSI is deeply grateful to our generous donors and the Christian Schools International Foundation Board for their support of high-quality professional development programs like CSESA. Their continued support makes it possible for such a diverse group of Christian educators able to attend from all parts of the US and Canada and have a compound effect on students. May God continue to bless this work.